Defenestration means being thrown out of the window. Jan Masaryk, the democratically elected President Czechoslovakia was defenestrated when the Communists took over in l948. There had been historical precedents for this going back to the 15th and 17th centuries when there were two separate acts of defenestration in Prague. The Prague Defenestrations are in fact now a tourist attraction.The artist Carl Andre was suspected of having defenestrated his wife the Cuban born artist Ana Mendieta, though he claimed it was suicide. 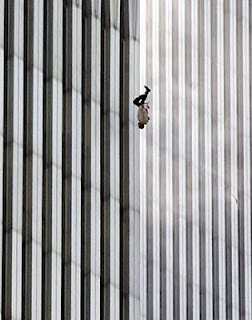 The Falling Man was of course the famous image from 9/11which later became the title of a novel by Don Delillo. After the stock market crash of l929 there were a number of defenestrations by despairing investors who’d lost everything. The soul singer Donny Hathaway reputedly was suffering from a depression that made him jump from his New York hotel room, though there were those who suspected foul play. Defenestration is such an elegant word and yet the acts associated with it derive from political conflict, domestic violence, financial ruin, clinical depression and in the case of the falling man, one of the greatest acts of terrorism in history. No one has ever jumped out of a window because they thought they could, though there have been some exceptional cases where children, falling from unprotected windows, miraculously survived. When you see someone like Phillip Petit effortlessly walking on a high wire high above Manhattan, you begin to wonder how agile man can be. Petit is a human fly who like Spiderman might be the only man or woman on earth who could turn defenestration into a sport.